Unique is a good word to describe this three-day gathering—as far as I know, something that has never been attempted before. Called Film-Com, it took place just prior to the Nashville Film Festival and consisted of bringing together two dozen film executives from Los Angeles and from other points around the country—major players in established production and distribution companies—to listen to twenty 30-minute pitches from filmmakers selected from around the world whose projects need financing, finishing funds, or distribution. The twenty film projects were chosen through open submission months and weeks prior to the event—much like one would submit to a film festival except in this case there were very few finished films submitted. Most were projects in the development stage with little if any financing in place, most had at least a script completed and possibly an actor or two or some other known talent attached, some were based on short films now being pitched as features. Our next feature project Someplace Like America was chosen as one of the twenty. Aaron and I were asked to prepare a one-sheet consisting of a poster and description of the project to be included in the Film-Com catalog to be handed out to the execs. We also put together our pitch that we’d present live in front of this room full of film financiers and distributors. We incorporated our short YouTube video on our project as well as constructed a slide show of still photos that we knew we somehow wanted to include in our film. We also armed ourselves with hard copies and a pdf of our script, our business plan, a three-page fact sheet, DVDs of our first feature The Sensation of Sight, and other pieces that might be called for if any interest materialized. In truth, we (and all the filmmakers) were not quite sure what to expect when we arrived. Neither did the execs. This was something none of us had never heard of before, let alone participated in. A thirty-minute pitch was unprecedented—and in front of a large gathering of film execs, most if not all of whom had never heard a pitch from a total stranger longer than a few minutes outside of their own private office or board room and certainly not with their competition sitting in the same room with them listening to the same pitch. There was one person who was confident that this was going to work and that was Andy van Roon, the man in charge of putting the entire event together. 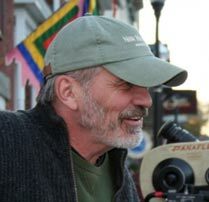 For years Andy has thought that independent filmmakers needed the opportunity to present their upcoming projects outside of the pressure cooker of Hollywood to those in a position to get seriously involved if they liked what they saw and heard. He thought that if he could bring the two sides together in a friendly environment with plenty of time to socialize and meet and talk in addition to the formal pitches that perhaps good things would happen. So the three days were filled with the pitches held one after the other on the twenty-eighth floor of the beautiful downtown Pinnacle office building overlooking the city. And then there were the evening events—lovely parties, an exquisite concert focusing on film music by the Nashville Symphony Orchestra, the opening night film of the Nashville Film Festival (the Weinstein’s Nowhere Boy) including the before and after parties, various workshops and panels, and on and on. It was indeed a wonderful opportunity to get to know other filmmakers and the execs. To date, Andy reports that nearly all the filmmakers who pitched a project are now in ongoing conversations with one or more of the companies who took part. And I’m happy to say that we’re included in those conversations. Needless to say, as filmmakers we’re very grateful that an event like this happened. May it be the forerunner of many more similar gatherings around the country and globe. To state the obvious, filmmakers can use this kind of support and feedback in the early stages of new projects. Not so obvious is that the film execs in attendance also felt that this was a new and refreshing way for them to connect with filmmakers and possible future partnerships. Thanks, Buzz, for sharing this update. Sounds like Film-Con was a very positive experience. How did you hear about it? Hope things are moving along… Still got my fingers crossed for you, and SLA is a film that needs to happen. Awesome. This is exactly what needs to happen. This should be part of the dream for every filmmaker. Plus, I think it should broaden out to beyond just execs but any potential film investor. A situation like Film-Com gives people who want to hear pitches a very low-key atmosphere that allows them to think about what you’re pitching without having to feel you’re selling to them personally. They don’t personally disappoint you and they don’t have to give an answer to people they’re not interested in. It also forces all filmmakers to ask themselves whether they truly believe they understand their film enough to pitch it to the pros. If I was at the point I am now with The House, several months ago, I’d be submitting my pitch to the fest too and crossing my fingers that I’d get in. Expecting great things ahead for SLA!